Online communication is an important part of any corporate marketing strategy. Therefore, redesigning your actual website or developing an absolutely new one is always something you have to do regularly, but it’s also a time-consuming job. If you redesign or add new features to your website, for sure you don’t want to lose your loyal visitors or lose adding a new one. 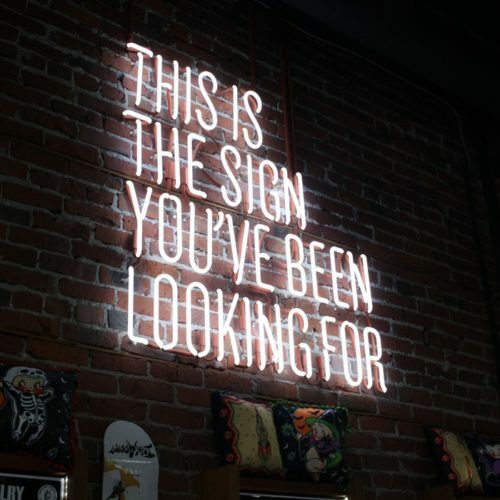 If you want to launch a new website or online store or blog, it’s also obvious you’ll want to have a large number of visitors from the very beginning. In order to accomplish any of these goals, you should definitely keep your audience informed. The best way to do so is to publish the so called “coming soon” or “under construction” website pages. I’m not talking about that horrible pages where you find just a logo and the text “under construction”. I’m talking about those temporary pages that will tell your visitors how long they have to wait till the website launch or where they can leave their email address and get a letter from you once the website is alive. By using this serene 3D Parallax template, you can make your visitors wait patiently your website launch. Instead of being overwhelming, the sparing use of the subtle elements of depth provides the Imminent template with a beautiful and relaxing atmosphere. With the impressive hover-over graphics techniques, it inevitably attracts everyone’s eyes along every move of the cursor and subtly catches their attention towards your forthcoming projects. Zoon is fully responsive, simple, clean and mobile friendly coming soon site template. Included in the template is a countdown timer, a google map section and an about section where you can add information about your team, company, group, etc. Zoon is easy to customize and is compatible with most modern browsers. Template Features: HTML5 and CSS3; fully responsive; attractive and modern design; gMaps; Fontawesome icon fonts; @font-face custom web fonts; Flexslider; jQuery countdown timer; smooth scrolling effect; cross browser compatible. AfterWork is a single page coming soon Bootstrap HTML Template with an easy navigation. Having 100% responsive design, it is perfect for Software/App launching. Completed with countdown timer, you just need to set the launch date. Template Features: two header styles (parallax and slideshow); Google Maps included; Twitter integration; unlimited fonts; nice icons by FontAwesome; email subscription working contact form. The Retro Creativo Free Responsive Website Template will let your customers know you are getting ready to launch something new and exciting. The style is creative, with a retro-looking layout and simple design. This template can be used in multiple industries and is completely customizable. Discover is a well crafted modern and responsive template or landing page build on top of latest bootstrap HTML5 and CSS3. This theme has a jquery countdown plugin in build. The template is designed at high-quality standards to meet the latest requirements and has a responsive design that fits in all devices with multi browser support. Template Features: Twitter Bootstrap 3.3.1 based; jQuery counter; Google fonts support; FontAwesome icons; background slider; Google web fonts; valid HTML; clean, flat & crisp design. 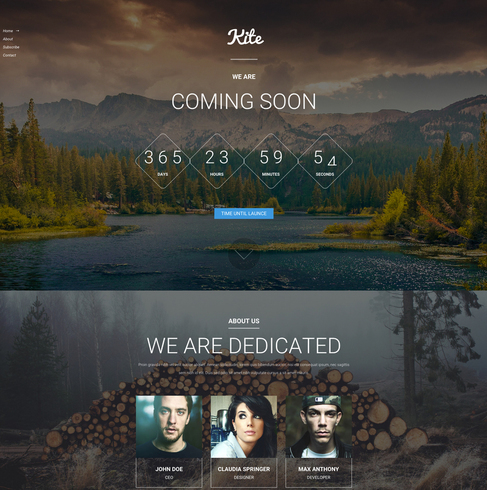 Kite is a beautifully designed website template built using HTML5, CSS3, and Bootstrap v3.1.1. The minimalist style will draw visitors in while your perfectly detailed and highlighted information will keep them on your site. This template would work perfectly for any website that is undergoing a transformation and can work well in any industry. Let your customers know about your upcoming website or project with Awesome. It is a fully responsive and coming soon bootstrap template with an impressive background and animated countdown timer preview. Template Features: one-page template; 100% cross-browser compatible; fully customizable; Awesome fonts and icons; responsive layout; bootstrap powered; jQuery countdown timer; email subscription bar; social media profiles support. Layla is a free, responsive coming soon bootstrap template and is perfect for your future site. Its creamy and its smooth animations with impressive video background will for sure attract the attention of your visitors. Bright colors also help to stand out. Template Features: video background header; fully customizable; ionicons fonts; device responsive; one-page template; cross-browser compatible; bootstrap based; jQuery countdown timer; active contact form; social media profile support; email subscription bar. WE+ Coming is a fully responsive and free to use HTML5/CSS3 based Coming Soon bootstrap template. The responsive layout and elegant animated countdown timer will surely attract your customers. Template Features: working subscribe form; device responsive; bootstrap powered; multi-browser support; jQuery countdown timer; Android menu sidebar; content area; social media profiles support; one-page complete layout. Khronos is a creative pack of coming soon template pages. Its elegant and clean design makes it perfect for every creative person, company, agency or anyone who is currently building its site and want to show a coming soon page in a creative way. Khronos is available in three style variations: static, slideshow, and particle background. It is fully responsive and retina ready, looks great on any screen and devices. It is also Mailchimp ready and has a working Ajax contact form. Template Features: easy customization; 100 font icons; working Ajax contact form; Mailchimp ready; retina Ready; 100% cross-browser compatible. Black is a simple and clean web template, with a background HTML canvas animation. It has a responsive design that is compatible with multi devices and it comes with unlimited background images. The countdown is powered by a custom jQuery plugin, you just need to set your launching date in the script. Template Features: 100% responsive layout design; working PHP subscription button; Google fonts support; fully customizable. This is a Bootstrap based coming soon one-page website template, which offers 4 different designs suitable for a standard website, application, video background website and a restaurant custom page. There is a WordPress version also available in case you want to integrate with your WordPress website. This coming soon template is licensed under MIT license and is completely free to download and use in personal as well as commercial websites. This is a modern and free coming soon template for use on websites which are under construction. Based on Bootstrap 4, this template is easy to edit for adding your own company or website information. The coming soon template features a full width image background and overlays the landing page text and a call to action button at the center of the page, along with social media icons. The template displays perfectly on every screen size and responds well to window size changes. Template Features: modern design; full width image background; Bootstrap 4 and FontAwesome; subscription form; easy to understand code. Spread the smell of the things you are baking and drag them towards your new creations with this elegant and clean looking template. The Maundy template with its minimal outlook is perfect for every creative person, e-commerce, corporate, agency, small and mid-size business, portfolio and for those who want to display product information until their website is complete. This template is user-friendly, functional and fresh-faced. Template Features: working subscribe form; Bootstrap framework; HTML5 based; CSS3 animations; multi-browser support; device responsive; FontaAwesome icons; social media profiles support; content area; jQuery countdown timer; scrollable full-page background image. Magnetic – a responsive widget coming soon bootstrap template. It’s an amazing template which will surely attract your customer’s attention. The customers of your site will love its cosmic landscape background, and animated LED countdown timer. Template Features: flat responsive widget template; cosmic landscape background; scenically designed; HTML5 and CSS3; animated LED countdown timer; email subscription form. 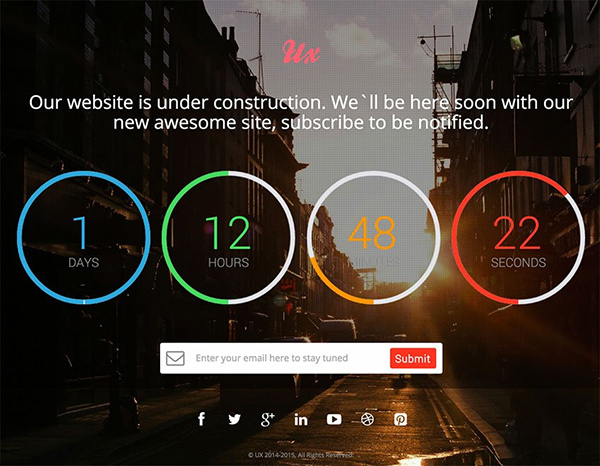 UX responsive coming soon countdown page is a clean, elegant, responsive, animated countdown coming soon page template. UX is prudently designed and coded for an under construction or coming soon website. Template Features: Mailchimp integration; contact form PHP script added; animated countdown timer; Twitter bootstrap based; fully responsive design; Cross Browser compatibility; easily customizable; HTML5/CSS3 based; social media icons; Google web fonts; FontAwesome icons; no coding knowledge required.